I just wrapped up four days at Sustainable Brands 2013 here in San Diego and my head is swimming. American culture shock mixed with immersing myself in the US sustainability and CSR (corporate social responsibility) market and being surrounded by lots of outgoing marketing types was a heady combination my first week back on the mainland. I am now happily sipping on an Aussie-style flat white (I found one in Bird Rock!) and reflecting on the past few days. First, a huge shout out to the organizers of the event, Sustainable Brands. Having been involved with three Green Cities conferences I can totally appreciate all the work that goes into these events. From an attendee perspective, it was flawless. I especially appreciated the commitment to sustainability including the goal to become zero waste, the availability of real coffee cups and glasses, and the amazing sustainable food options, most notably the vegetarian barbeque. 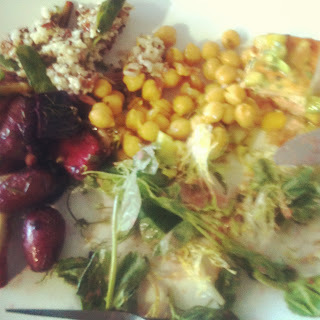 My lunch one day - so many delish local vegetarian dishes! I don't have such a positive opinion on all the content, however. As someone who is undoubtedly 'dark green' (to use marketing lingo), I had a hard time with some of the speakers. London-based sustainability communications agency Futerra led an ongoing debate as to whether brands are the problem or the solution to sustainability, and after this week I remain on the fence. I'd like to think they could be (they do have the dosh, after all! ), but some of the companies at the conference do a whole lot of greenwashing and leave me skeptical of their intentions. Many keynote speakers highlighted the importance of transparency and authenticity, so I hope all the brands start taking notice. I was particularly disappointed in the session on the Bangladesh disaster and other outsourced factory worker safety issues. Apart from one or two panelists (who did not represent brands) and the excellent moderator, the panelists seemed to largely pass the buck to consumers for demanding cheap goods and/or the broken auditing systems. Whilst I understand it is a complex situation on all sides, the blatant refusal to acknowledge brands' roles in the overall problems is unacceptable to this fashion purchaser and ethical goods advocate. Trust me, people will respect your company more if you are open, acknowledge that your company plays a part in the status quo, and commit to work on a solution - even if you don't know what your brand's specific solution is just yet. Enough is enough, and we consumers are demanding more and better of you. But let's end on a light note, shall we? There were some amazing examples of projects made possible by corporate brands and the amazing bank accounts and connections they have at their disposal. Philips has created Community Light Centers in Africa. I had the privilege of spending two months on this amazing continent last year, and I know these centers will make a huge impact to the daily lives of individuals who could use some more smiling and hope for a brighter future. Similarly, after visiting India and previously working for a non-profit working on health issues in rural India, I am impressed with the following handwashing campaign led by Unilever called Lifebuoy. I hope both these organizations have long-term commitments to these important projects. I will definitely be keen to know the long-term impact. Exciting stuff. Unilever is also behind the Dove Real Beauty Sketches campaign. I suspect most of my female readers have seen it, but it's worth watching again and again, and reminding yourself how beautiful you are. Finally, this hilarious clip by the Rainforest Alliance had most of us laughing - I can totally relate to this guy! Just as you don't have to give up your style to be sustainable, you don't have to change your entire life, either. Follow the frog instead. Now after all that serious 'office work' I'm off to Yosemite! I'm ready to immerse myself in nature for a few days ahead of reconnecting with my family in Utah. I'll keep you posted on the sustainable experiences I have along the way. And watch out for more specific blog posts on some smaller projects I came across at the conference over the coming weeks - there are quite a few things to get very excited about!